Wild Strawberry Lodge is an Alaska fishing lodge in the summer, and a bed and breakfast, as well as a short and long-term rental in the winter months September-mid-May. Call 1-800-770-2628 for rates and availability. We offer large group discounts! There are eight rooms in the main lodge, Apartment #10, and two separate self-contained lodging facilities: the “Front House” and the “Cabin.” The “Wild Strawberry Suites” are new additions of five private suites. We will do our best to accommodate your group depending on available dates and the size of your party. The Front House, Cabin, Apartment #10, plus five Wild Strawberry Suites are all available as long-term rentals in the winter months. Please contact us for weekly or monthly rates. 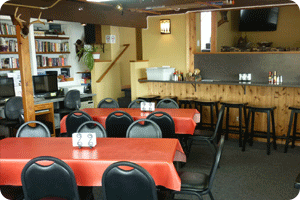 The lodge is located in Sitka, Alaska, adjacent to Thomsen and Eliason Harbor. The bedrooms in the main lodge are various sizes, accommodating anywhere from two to six guests. Each room has Cable TV, a private bathroom and daily maid service. Great water views of Thomsen and Eliason Harbor are available from most rooms. If you are looking for a clean, comfortable, friendly place to stay in Sitka in the winter, look no further. Wild Strawberry Lodge Bed and Breakfast is where you want to be!